“We know the country that harnesses the power of clean, renewable energy will lead the 21st century” - President Barack Obama, address to Congress, February 24, 2009. Energy consumption, diminishing fuel reserves and global warming are worldwide challenges facing the all of us. Renewable energy is the key to the future. Our world has seen many benefits from powerful, nonrenewable fossil fuels, but we are learning now that fossil fuels cannot be burned without consequence. As an alternative, we can generate electricity and power our vehicles with clean, renewable energy. There is no escaping the need for energy use in our homes, offices, and schools. However, there is a choice. The more we reduce our use of dirty energy, the healthier our planet will be. And more often than not, switching to renewable energy is going to help us reduce our dependence on foreign sources and will stimulate the national job market. This means more of our energy dollars stay at home. Utilizing renewable energy is a very effective means of reducing energy related greenhouse gas emissions. Renewable energy is generated from natural resources. Renewable energy systems include technologies to capture solar, wind, geothermal, water or bio-based energy to produce electric power or thermal energy. These sources are naturally replenished and are all domestically available choices that hold great potential for our future. These technologies generate clean power and have a lower impact on the environment compared with conventional resources. Renewable energy can be used to create electricity and for transportation purposes. Renewable fuels can be made out of plants (corn, sugar cane, etc.) or even from leftover cooking grease. Biofuels, such as biodiesel, recycle waste products like fats, and agricultural waste can be turned into green energy. Algae is being called the biofuel of the future. It takes up sunlight and carbon dioxide and rapidly creates oil at a rate 15 times per acre greater than other biofuel crops. Because it takes up carbon dioxide, it also helps reduce global warming. Solar energy powered directly by the sun is abundant and is the most well-known renewable energy source. Did you know that if properly harnessed, enough sunlight falls on the earth every day to meet world energy demands for a whole year? The fastest growing alternative energy source is the solar photovoltaic cell - taking the sunlight and converting it into electric power. To learn about incentives in Florida to use solar energy, visit this link . 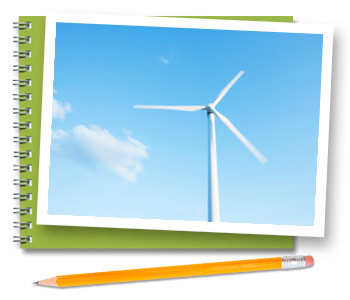 Wind power is a clean, renewable source of energy and its use has been around a long time. Windmills were used many years ago to pump water or grind grain. Wind power has gained considerable interest in the last decade. Most wind power today is generated by using rotating turbine blades and converting it into electricity. Some areas of the country are more suitable for this type of renewable energy – especially the northeastern US and California. Modern wind turbines are very quiet and rotate very slowly. To generate a considerable amount of wind power requires large amounts of land for wind turbines, which can produce large amounts of power. Installing solar photovoltaic (PV) panels on top of walkway covers and on the roof at several schools. Installing solar powered flashers at crosswalks. Generating power to be used at a school by installing solar arrays. Researching various renewable energy technologies and how the Broward County Public Schools may benefit from them in the future. Energy can be captured from water and yield a large amount of power. Sources of this type of power are rivers, oceans, tides, and wave power. Geothermal energy is another renewable source, which is harnessed from the earth’s internal heat. This energy source is closer to the earth’s surface in some places than in others. In the past, this energy has been used for bathing and heating homes on a small scale. Hot springs are heated through this energy. Certain places, such as Yellowstone National Park, with its numerous geysers and hot springs, is an ideal location for harnessing this type of power. People may not realize it, but the cheapest electricity is the electricity we do not use. We can make lots of simple changes in our schools and our homes to save electricity. In fact, green building experts often recommend that before a solar panel or a wind turbine is installed that a property owner does everything to make their buildings efficient first! Read more about energy efficiency here on our Web site. Get involved! Projects in your school are a great starting point. Encourage change. Consider using biodiesel in buses and in mechanical equipment. Renovate green. Incorporate renewable energy options in renovation projects. If cost is a factor, use energy options as part of your project, (i.e. install a solar panel to support a hot water heater or heat a pool). Learn more. Research federal and state incentive programs, which help offset the initial higher costs. These costs may be paid back within a few years and will produce savings thereafter. Buy green. Purchase green energy through your utility company. Be knowledgeable. Keep up-to-date with new technologies concerning renewable energy. Click here to learn about the ways we can support renewable energy. It is up to all of us to do what we can when we can.